The Man Engine is the largest mechanical puppet ever constructed in Britain. He stands at 4.5m when he’s on his transporter, or when he ‘crawls’, rising to 10.2m when his ‘transformation’ has taken place and he ‘stands’ erect. He made his triumphant debut at Tavistock, just over the Tamar in west Devon, on July 25th this year. He has just completed his two-week Progress 130 miles through Cornwall, from Tamar to Geevor Tin Mine at Pendeen near Penzance. But he’s not just an entertainment for Cornish residents and visitors: he’s a visible and stirring reminder of the dangerous, often fatal work of the Hard Rock Cornish Miners, and of the relative prosperity and security this difficult, demanding work brought to some sectors of the Cornish people for some two hundred years. I’ll post more on this shortly, and on the experience of my wife and I, and grandchildren, when we went to see him in Truro and Camborne. 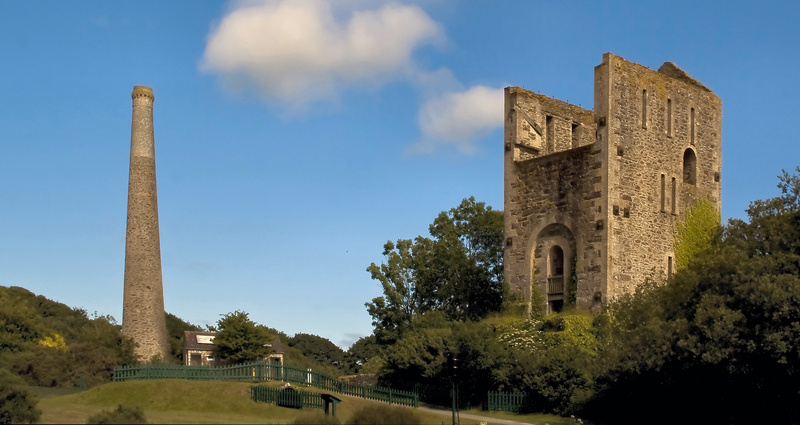 Mining for minerals in the county dates back to the Bronze Age, but the heyday of the industry in the Duchy was in the early 19th century, when Cornwall had some 2000 mines, and was the leading supplier of copper in the world. The most important minerals that were mined were tin, copper, silver and lead, but gold and arsenic were also important. 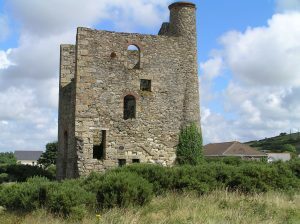 The landscape and skylines of Cornwall have been largely shaped by the mining industry: engine houses and other industrial archeological sites proliferate, especially in mid-Cornwall around Camborne and Redruth, and in the far west. Tram and train lines formed a network of supply and transport for the industry, many of which survive today. Thriving ports exported the minerals. Technology developed to facilitate ever more efficient means of accessing, digging out and marketing the deep-hidden wealth beneath the Celtic landscape of moors, rocks and picturesque townships. In 1689 the technological innovation of gunpowder was introduced to the Cornish mining industry for the blasting of rock. It was imported until 1808 when the first Cornish gunpowder factory opened at Perranarworthal, midway between Truro and Falmouth. Such places were located in secluded and wooded river valleys to provide a source of water power and to protect neighbours, who would be relatively screened by the trees. Even the roofs of these factories were designed to come off easily in the event of an explosion. In 1831 William Bickford, from Tuckingmill near Camborne, invented the safety fuse. Blasting in mines was highly dangerous. Previously, holes were drilled into the rock, filled with gunpowder and tamped, and the relatively primitive ‘quill’ fuses inserted and lit to blast the rock. The fuses were temperamental and unreliable, and caused many serious injuries and deaths in the mining industry. If the quill fuses failed to ignite the gunpowder to blast the rock and expose the minerals, the miners would have to wait until it was considered safe to do so – a risky process called ‘to hang fire’, hence the expression today. Bickford’s invention made blasting much safer. The first practical high explosive charge for blasting in a Cornish mine took place in 1846 at Restormel Iron Mine near Lostwithiel. By the 1880s high explosives had largely replaced the less efficient, slow-burning gunpowder. In 1866 Alfred Nobel invented the nitroglycerine-based explosive dynamite. Soon after it was first used in Cornwall’s mines. 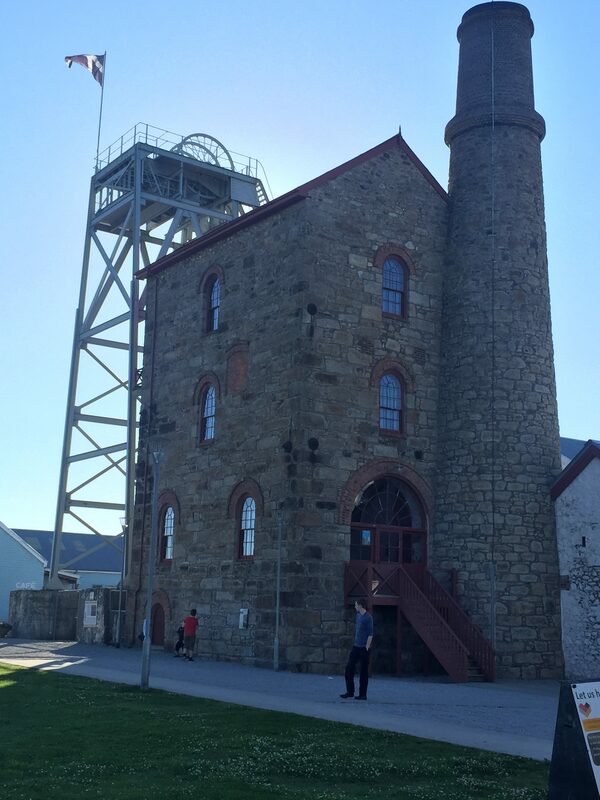 The first Cornish dynamite factory, the National Explosives Works, was set up in 1888 in the protective seclusion of the dunes at Hayle Towans (‘towans’ is Cornish for ‘dunes’)– but accidental explosions did take place. It’s still possible to see the traces of the site, which at its height covered 300 acres, and the network of single-track railways that serviced the enterprise. During WWI the company manufactured a range of high explosives for the British military. The site closed in 1920, but continued to be used for the storage of explosives until the 1960s. 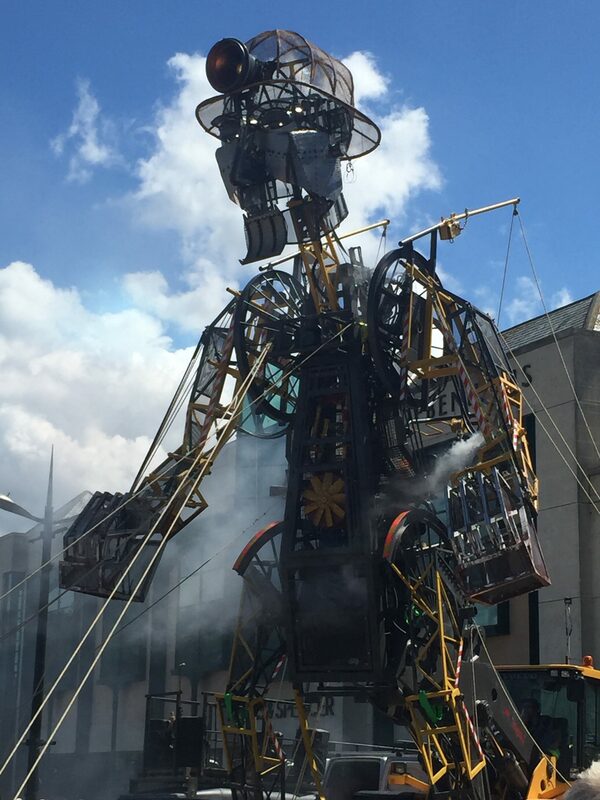 So why the Man Engine? These were mechanised devices to enable miners to access the levels they were working at, often deep underground. They were only paid for the time they spent at the rock face – they often faced long (2-3 hours) and arduous, dangerous climbs up and down slopes or ladders before the invention of these devices. The first man engine in Britain was installed at Tresavean Mine in Gwennap in 1842. There were sixteen of them in Cornwall in total. They operated by exploiting the rise and fall of the rods which operated the steam-powered pumps that were essential for emptying the shafts of water. 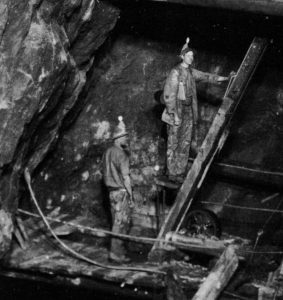 The miners would step from rod to platform every twelve feet, and hence make his progress up or down, often many hundreds of meters, in a kind of stepped paternoster elevator. 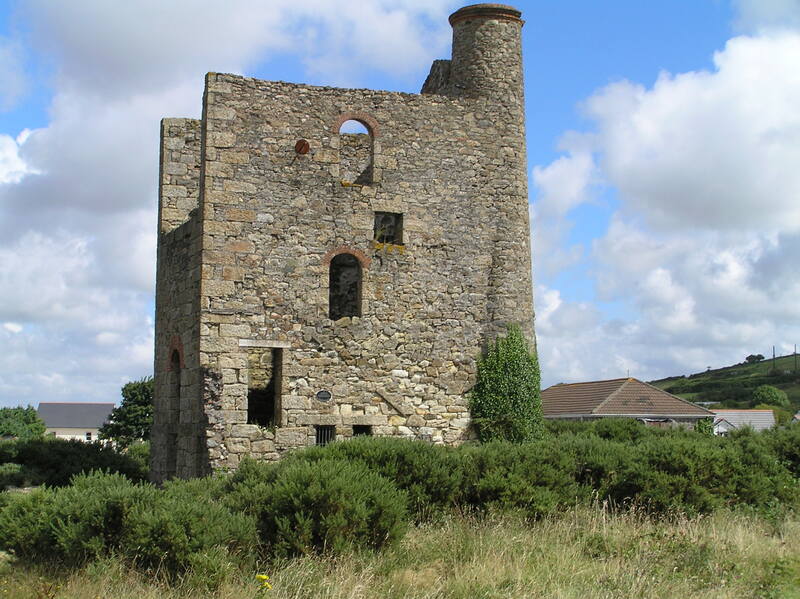 Dolcoath (near Carn Brea, Camborne) was the fifth largest of around 470 copper mines in Cornwall. When the copper looked like running out, deeper shafts were sunk to mine for tin at lower levels: by 1882 the deepest was 660 meters, later over 1000 meters, making it the deepest in Cornwall; there were 12 miles of serviceable tunnels, and many more older, unworkable ones. In 1893 seven men were killed when stulls or props gave way half a mile underground and a tunnel collapsed on them. Another hazard was hookworm, which infected nearly every miner. The men defecated in the shafts, and this enabled the parasite to spread. Tincroft Mine has the only remaining complete man engine building in Cornwall. The beam engine which it housed was used to power the man engine in nearby Dunkin’s Shaft. The last to operate was at Levant, where a terrible accident occurred in 1919, killing 31 miners, men and boys, when the cap that held the main connecting rod broke. 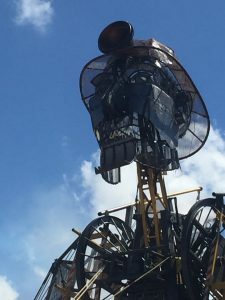 Historians say that the man engine had a good safety record prior to that disaster, for before its use there were frequent accidents, often fatal, especially when tired miners were climbing ladders up the long shafts from deep underground, exhausted after their long work shift. 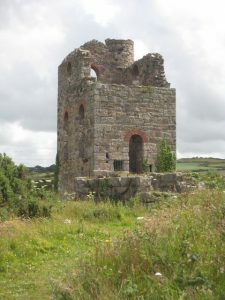 The engine house and stack at East Wheal Rose, St Newlyn East, near Newquay, Cornwall was principally for lead ore (galena) but also silver, zinc. 39 miners died underground in 1846 when torrential rain flooded the shafts. Since 2006 the Cornwall and West Devon Mining Landscape has been a World Heritage Site. Its gateway site, Heartlands, opened in 2012, on the site where South Crofty tin mine became the last operating mine to close operations in Cornwall in 1998.
has many links to all kinds of related materials, including the story of the Cornish diaspora – Cornish miners took their knowledge and experience to all corners of the globe when their home mines ceased to be productive or economical. Links also to various mineral railways and the ports they serviced, and to individual mining areas and the more prominent mines and individuals associated with the mining heritage of Cornwall.